How to temporarily fix a broken window? Every real estate owner from time to time faces a violation of the integrity of windows. For example, children in the yard can play football and accidentally break the glass, or unexpected weather changes may occur that distort the structure and cause the windows to become unusable. It is not always important to change the double-glazed windows on the day of their damage, as it may simply not be possible to do this. There are several ways to temporarily restore the basic functions of a damaged window - preservation of the indoor microclimate, as well as protection against insects. If you see that the glass is broken, but remains in its seat, then it is worth more time to carefully and more closely familiarize yourself with the nature of the damage. If you notice a banal crack on the glass, then this is a non-critical defect that requires quick elimination. You can use scotch tape and simply seal the seam along its entire length. Perform this work is in protective gloves and as carefully as possible, so as not to get hurt. If the glass began to hang out strongly, then in this case it will not be possible to manage it by gluing it with adhesive tape. A loose piece in its seat will need to be gently removed from the window frame, using gloves for this. After that, you can use a transparent oilcloth to replace the missing piece of glass. It can also be glued to the window by means of the most common scotch, but it is important to ensure that the surface is degreased and clean. When the tape is glued, and the film is fixed to them, remove the accumulated excess air. If the glass has received a lot of small cracks, but you cannot replace it in a short time, then in this case you can use the classic nail polish. It is advisable to choose a colorless variety, so that the treated area is not conspicuous. Smearing small cracks in the glass, you can at some time to restore the tightness of the glass. It is recommended to apply nail polish in several layers to ensure maximum quality of the seams. 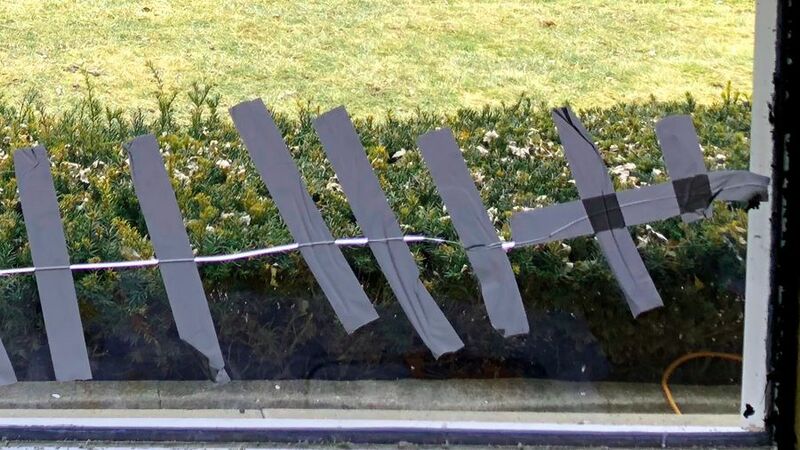 If the damage to the window turned out to be too serious, there is no way to fix them with scotch tape, film or nail polish, then you should not despair, as you can replace them with any plastic sheet of a suitable size. This is a great option when you need to temporarily restore the window until its scheduled repair. This option is good for its availability, and you can find a piece of plastic panel in any hardware store. Note that the plastic can be of any color and thickness. You can choose a transparent material, but its capacity will be several times less than that of glass, so you will not have to rely on good natural lighting. Convenience lies in the fact that the plastic can quickly enough cut the details of the desired size, and then fix them on the window frame in a convenient way. For example, you can use a stapler or small nails, but only if the window is wooden. If you decide to make a temporary repair of the window with your own hands, then for this you need to acquire a number of necessary things. To ensure proper safety, you need protective gloves. Prepare a transparent film or plastic sheet, if you patch the glass with these materials. You may need a nail polish, a tape measure or a pencil to mark out the parts to be cut. However, all these tools are available at each house, therefore it will be possible to carry out repair work in a short time.